With thanks to FAME and its generous community who support the Aussie Ark project, we are pleased to celebrate the recent arrival of several babies. A Southern Brown Bandicoot named ‘Crash-Andicoot’, is currently being raised by Devil Ark Keepers. Having grown from 160g when first discovered to an impressive 350g Crash is growing quickly and is a fantastic sign of successful breeding within Aussie Ark. 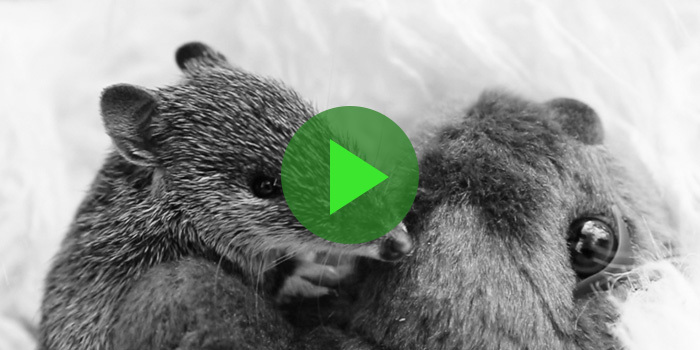 Crash is just one new Southern Brown Bandicoot contributing to a larger population of Bandicoots scheduled for release in early 2019 into Aussie Ark Sanctuaries. Watch Crash in this video, he’s just divine! Aussie Ark also welcomed their first Parma Wallaby joey. Since the opening of Aussie Ark in November 2017 the keepers have been watching closely to ensure all species are healthy and happy; and having a Parma Wallaby and Southern Brown Bandicoot young, is obviously a great sign that they are settled in and feel right at home. The Parma wallaby is a small shy, cryptic creature of the wet sclerophyll forests of southern NSW. This small, herbivorous Wallaby is currently listed as near threatened with the IUCN and vulnerable in NSW. These young are a huge milestone and a wonderful achievement as we build a robust population in the fight to stop extinction of their species.